I know this seems like an innocent thing to think. But I've found it's one of the trickiest, undercover, joy stealing, time robbing, relationship ruining, and health-risking thoughts you can have. When you think, this thought over and over, eventually, it will take over your time and your life and even if you have free time it will never feel like that because you won’t be present. You’ll be too busy being stressed about what you should be doing and you will resent all of the time in your life being about “having to get stuff done,” and this my friends will lead to a less productive and joyless life. Plan your down time first. Take it no matter. Be fully present. Get rid of thinking you should be doing anything else but practicing your downtime. Schedule your productivity time, limit it, commit and follow through. More joy in your downtime means you have to stop thinking that you should be doing anything else. When I let go of this devilish thought, "I should be doing something else," everything changed. I imagined myself with a straw basket twirling around in the outdoor marketplaces in the South of France. I don't actually twirl around, but it's the feeling state I always want to go for-- pure joy and carefree time for play guilt-free. What’s the feeling you most want to create in your life? What might you visualize yourself doing as a result of that feeling state? You must plan your down time first. My free time revitalizes and energizes me so I can do the work I love, be laser-focused and super productive. Nowadays, I wake up in the French Riviera with my cup of coffee and coconut cream. I do my thought work, visualization and set my intentions for the day, I study half an hour of French, have breakfast on the villa terrace overlooking the Côte d’Azur. What kinds of things do you like to do with your free time? My un-guilty pleasures. I want you to get really good at yours. Some mornings I go for a walk down to the outdoor Liberation marketplace to get fresh food and flowers. I practice my French at my favorite cafe. I order a coffee with milk that the cafe owner endearingly calls “soup,” because they usually only serve espressos. I order a croissant or pain au chocolat (if I’m feeling especially frisky) and enjoy myself some people watch. What do you enjoy that feels leisurely and indulgent? My free time includes 3 yoga classes a week, which are non-negotiable. Yoga is a natural anti-anxiety, antidepressant and overall mind-body-spirit connection for me. I can’t live well without yoga. I take the weekends off. The French have helped me become completely productive-free on Sundays because in France everything is closed. What do you know is good for you that you can’t live without? How much free time would you ideally like to have each week? What things can you take off your schedule to make more time for yourself? Weekdays I start work around noon. On the days that I don't have clients in the evenings I may work 4-6 hours. I always give myself a certain amount of time to get projects done and I do my very best to stick to that timeframe. I’m not perfect at it, but that’s not the point. How many hours would you ideally like to work in a week? The point is I want to enjoy my life, reach my dreams and keep evolving to the next best version of myself. I want that for you too. 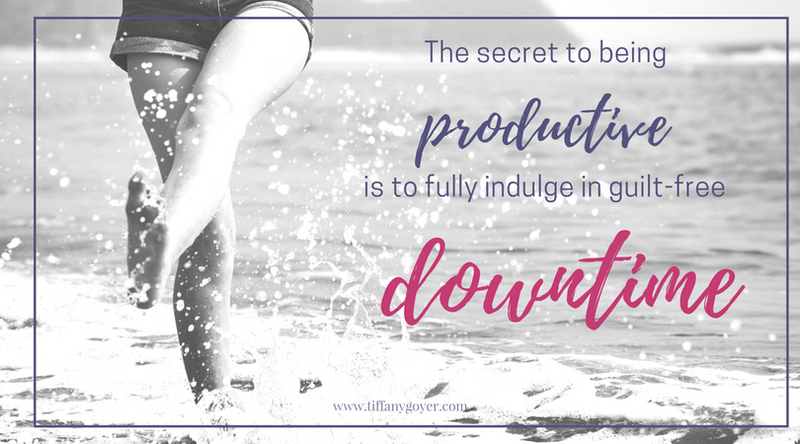 The secret to being productive is to fully indulge in guilt-free down time. I have more time now then I had when I was unscheduled and worried all the time. I still get to be spontaneous and I certainly don't feel caged in. But this wasn’t always the case for me. There was a time in my life when I was at the height of my busyaholicness and on the verge of burnout, that I too resisted scheduling my time, free or otherwise. It was one of the busiest times in my life and oddly one of the least productive. Because of the chronic busyness and already over-scheduled work life, I was totally resistant to scheduling myself any more than I imagined I already was because I thought like you might be thinking that it would add to my stress. Man oh man was I wrong. And what a consequence I paid. It’s called Burnout. It was a constant state of stress with these thought buzzing in the background of all my moments, exhausting me and sucking the joy right out of my life. Unfortunately, this is a story I hear over and over again with my clients. I lived many years this way. It’s a total nightmare way to live. I see so many of you doing that to yourselves it’s frightening, and I can help you end the madness. I call this “being so busy that you can’t get anything done syndrome." Time is one of your most important commodities. Spend it wisely. Know that when you fail to plan ahead and follow through on how you will use your time, inevitably you end up feeling guilty about your free time. It’s like eating a banana split and not enjoying it. Don’t do this with your free time, enjoy it. Be honest, how many times in the last week, did you have free time that you didn’t enjoy because you’re thinking you should be doing something else? Stop thinking that, please. The reason this is a big deal is that in the long run, you end up without joy in your life, just living to finish the next task on your list, unable to truly enjoy free time or time allotted for other things. Even if you have free time, you feel like you don’t because you are constantly thinking about what you should be doing instead of relaxing. When you never take time for yourself, your productivity goes down. Now you aren’t taking time off and you aren’t being productive. Where is the joy in that? How is that serving you? I promise you will have more time, energy, love and joy in your life if you schedule your time. And you’ll likely be 50% plus more times productive than you’ve been. Give it a whirl. Do you do this? Do you worry about what you should be doing so much, that you tire yourself out before you even get a chance to do it? This coupled with lack of scheduling downtime and productive time leads to getting stuck on that hamster wheel of shame and disappointment in yourself instead of making progress towards your bigger dreams and goals. Scheduling your downtime first and your productive time affords you more freedom in your life and more opportunities to experience joy. I know this well and I know how to help you end the madness and create a life you enJOY. The kind that seems like it’s only possible in fairytales and reserved for “other people." But anything is possible for you. This constant nagging thought wore me down. I felt like I could never enjoy any downtime. I ended up resenting when I had to produce. I always felt like I needed a break. Because my mind was going on nonstop about what “I should be doing” my time was literally ruined. Plan out your week ahead! First, plan your downtime. This is the fun part- what do you like to do? To read, paint, pet your cats, garden, walk, take long baths? Plan for that. Then schedule the time that you need to be productive in whatever you do. Don't blur your downtime and your production time anymore. I promise you your life will start to feel like joy. Let me know if you need more guidance. Newer PostGot conflict? Need some skills? Peace out!